These stylish mirrors are made of solid oak, and are glued and screwed together for long lasting strength. They each feature three solid brass coat hooks with an antiqued finish. 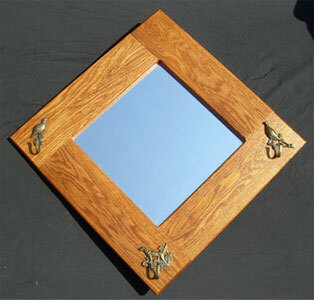 The mirrors measure 32 1/2" wide by 32 1/2" tall. They have two hooks mounted 16" on center for secure hanging on wall studs. Golden oak is the most popular stain, although other shades are available. Contact for details on matching your decor.